As Japanese bike gangs succumb to police pressure an aging outlaw confronts his tough guy past and tackles the dwindling options remaining for his future. For decades Japanese bosozoku or &quot;Speed Tribes&quot; have dressed in kamikaze styled uniforms, battled rival crews, and cruised the midnight streets on thunderous, customized motorcycles, all-the-while embarrassing Japanese police with their road warrior antics. But now the authorities have turned the tables on outlaw bikers with new laws and new tactics. 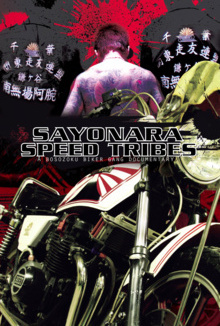 “Sayonara Speed Tribes” documents the life of Hazuki, former leader of the legendary Specter crew. As a retired bosozoku - having graduated to the yakuza (Japanese mafia) he mentors a fresh crop of less-than-enthusiastic bikers – a far cry from his days of glory as a bosozoku warrior. Hazuki becomes more and more disillusioned with his gangster existence and utilizes the tools he wields best: his fists. Training as a kick boxer could yet prove tougher than surviving his street battling days, even more daunting than facing down the gang he has turned his back on.